1000 issues is a milestone few characters will ever see, and even fewer titles will see. So no matter whether you love Batman or hate Batman Detective Comics #1000 is something to commemorate by the whole industry. By comparison, it was just a few years ago that Archie Comics celebrated issue #600, Archie Andrews being only two years younger than Bruce Wayne. 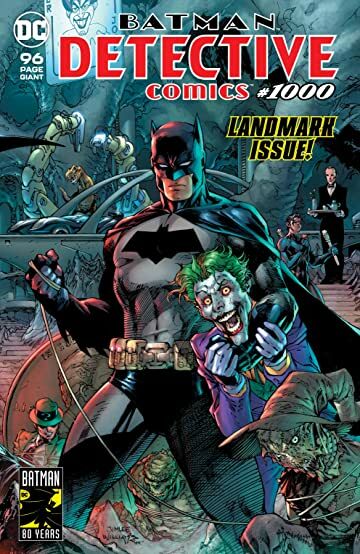 DC Comics has taken the opportunity to celebrate the title that gave them their companies with an oversized, 100 page, special with 10 stories from across Batman’s storied career. While I’m not a major Batman fan, I can certainly appreciate the tales here. I don’t think all of them hit the mark, but they all had something special. Kevin Smith’s story, Manufacture For Use, takes one of Batman’s darker habits down a hole that even Alfred couldn’t see coming. It’s a story that belongs in any and every version of Bat-Canon. My favorite story in the whole volume has to be Brian Michael Bendis’ story, I Know, which features an aged Oswald Cobblepot visiting an equally old, wheelchair-bound, mute, Bruce Wayne. I’m not sure I would love Alex Maleev’s art in every situation, but it was perfect for this story. On the lighter side of things, Paul Dini’s documentary-style Legend of Knute Brody follows the career of the worst henchman in Gotham City. One of the things that has always turned me off about Batman is the “bat-everything” factor. It worked great for Adam West, and for a gag here and there. But, The Last Crime in Gotham is a story that pretty much exemplifies everything I dislike about the franchise. It takes Batman on a crimefighting-romp with his whole family in tow, complete with the family dog. It was a cute story, I guess, but the Incredibles did it better. Twice. With the penultimate story, Batman’s Greatest Case, Tom King gave us a very different spin on bat-fam. Plus it did so in a way that had sass, snark, and heart which was great. The last few pages set up the next storyline that will carry Detective Comics into their next 1000 issues.